This pizza was so much fun to eat, and it was great way to reuse my Baker's Edge brownie pan! 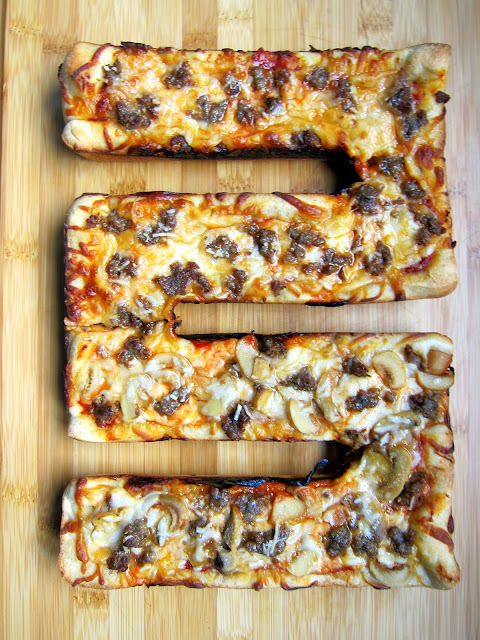 This pizza is great for your family night because everyone can have their own row and use their favorite toppings. 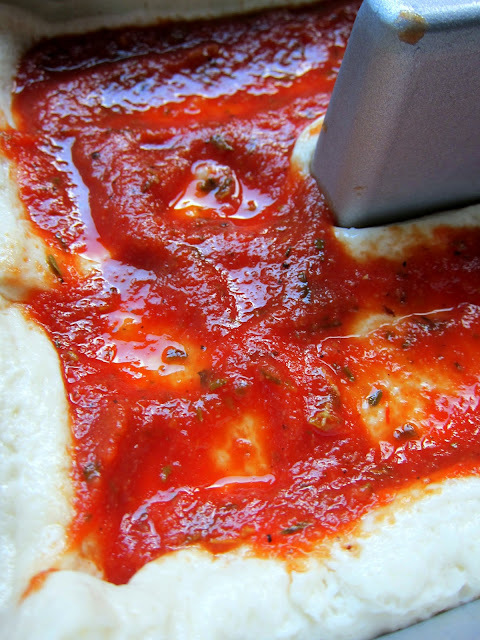 I used a can of refrigerated pizza dough and made my own pizza sauce. If you don't have a Bakers Edge brownie pan, you still need to try the sauce. It was absolutely delicious and super simple to make. It was much better than store bought, plus you can control the ingredients (and sodium) in it. This will be my new "go-to" pizza sauce for our weekly pizza night. Prepare the sauce. In a medium sauce pan combine, tomato sauce, garlic powder, onion powder, thyme, oregano, salt and pepper. Allow to simmer 15 minutes. Remove from heat. Lightly spray Bakers Edge brownie pan with cooking spray. 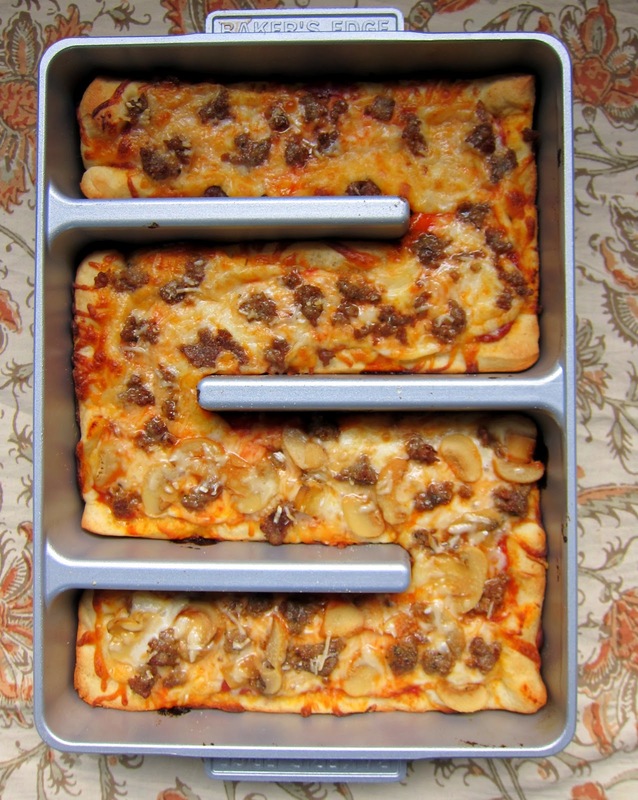 Unroll pizza dough into a 10x14-inch rectangle. Cut dough into 4 strips - approximately 3.5x10-inch. Place each strip of dough into brownie pan, sealing seams at the corner. Top dough with pizza sauce. Add cheese and then your favorite pizza toppings. 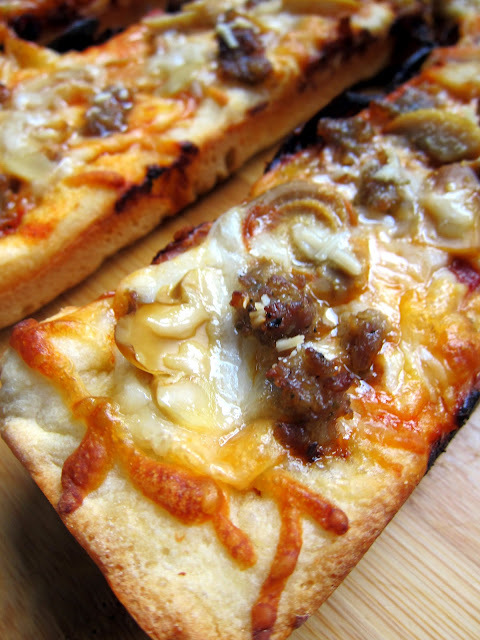 Bake 20-25 minutes, until crust is brown and cheese is melted. Genius! We were just having a discussion the other day how no one in our family likes the middle pieces when we cut pizza in squares. Problem solved! GREAT way to use my brownie pan!! Cannot wait to try this! It's funny, I never thought that pan was a good idea for brownies (everyone in my family wants the gooey center pieces) but it makes perfect sense for pizza! My sister-in-law gave me that pan several years ago. I haven't loved it for brownies though. Pizza looks like a fun idea. I don't think my kids will believe it's pizza if it's not a triangle though! That is a genius pan! Where can I get one. I need some of this pizza right now! Gayle - amazon.com sells the baker's edge brownie pan. It has free shipping too! What a fantastic idea! I've never come across that pan other than seeing it on Oprah's giveaways. What a fun pizza! The sauce looks yummy. Is that ground oregano or dried in the sauce? I've thought about getting one of these brownie pans-I LOVE the edges, but couldn't justify it for just one item...now I am inspired and also wondering about making a row of cinnamon rolls ("this row has nuts") and how about Lasagna ("this one has all the good stuff jammed into it, this one just cheese") as well as meatloaf for easy portioning to the freezer! Yum! Those are all good ideas! If I don't have dried whole thyme, can I use dried ground thyme? I love that I can use my brownie pan for something other than brownies! You're so clever!! !